For our final city in Chile, it was back to the desert! 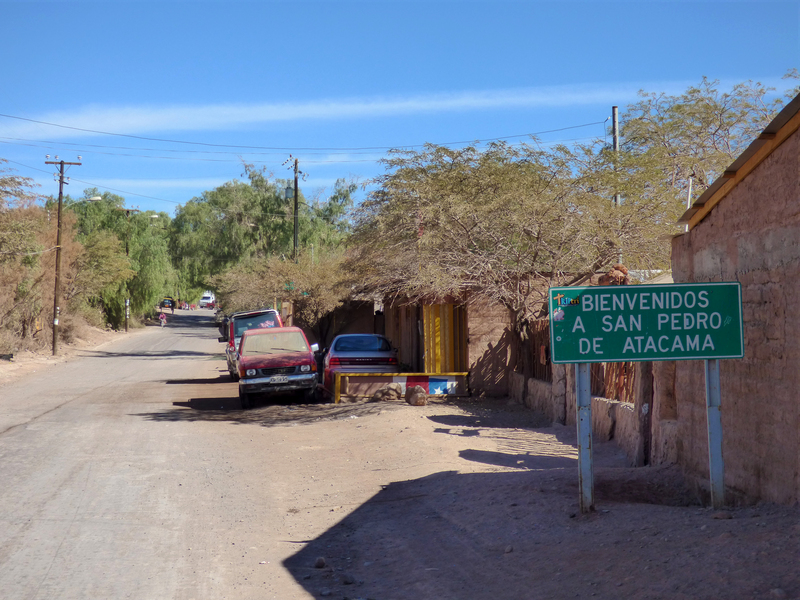 San Pedro De Atacama was one of the smaller, less developed towns we have been to and also one of my favorites! We hopped on an overnight bus out of Argentina and arrived in San Pedro first thing in the morning. The first shock was the bus station. We arrived in an unlabeled dirt lot with barely enough room for 5 or 6 buses. Around the corner, a sign was hanging, labeled “Estación de buses”, and appeared to have been painted by a 7 year old child. The building that housed the few workers was made entirely of adobe with no running water or bathrooms. So, when I say San Pedro is a small town, I mean really really small! While some people don’t like small towns, I absolutely love them. The quiet, the simplicity, and the culture have a draw that I don’t believe anyone can deny. 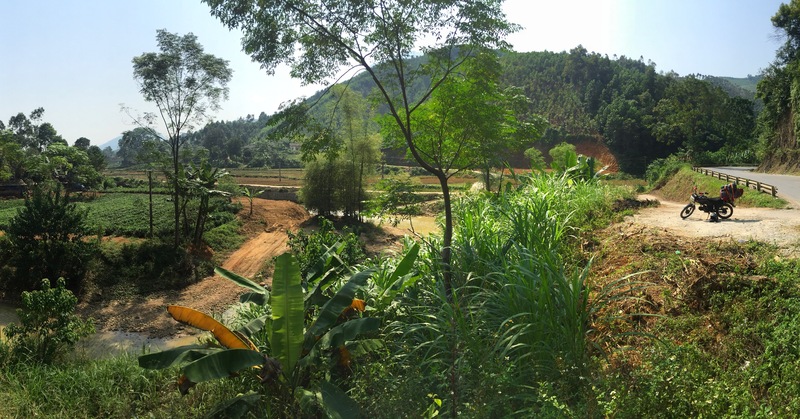 So, as we walked down the dusty dirt roads towards our hostel, I couldn’t stop smiling. Dirt roads, adobe homes, and volcanoes surrounded us with no sign of technology or modern-ness in sight. 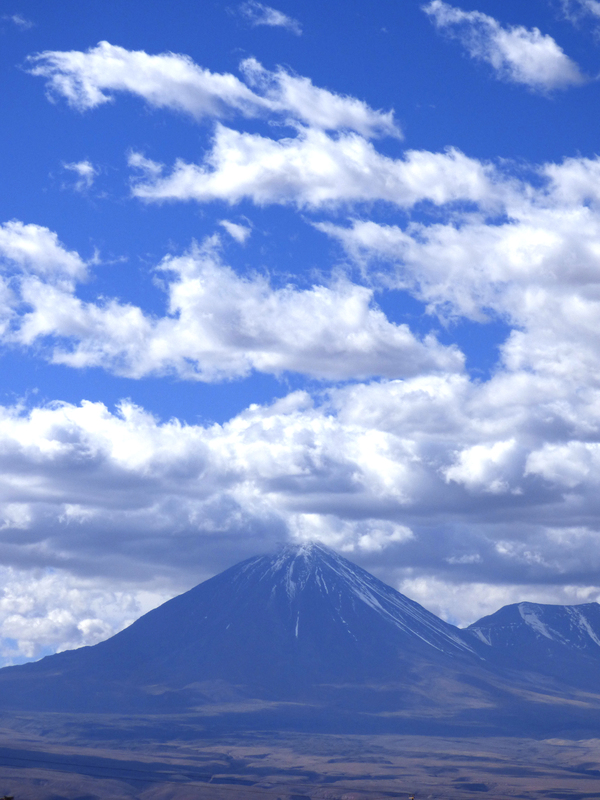 Volcan Licancabur towers over San Pedro. 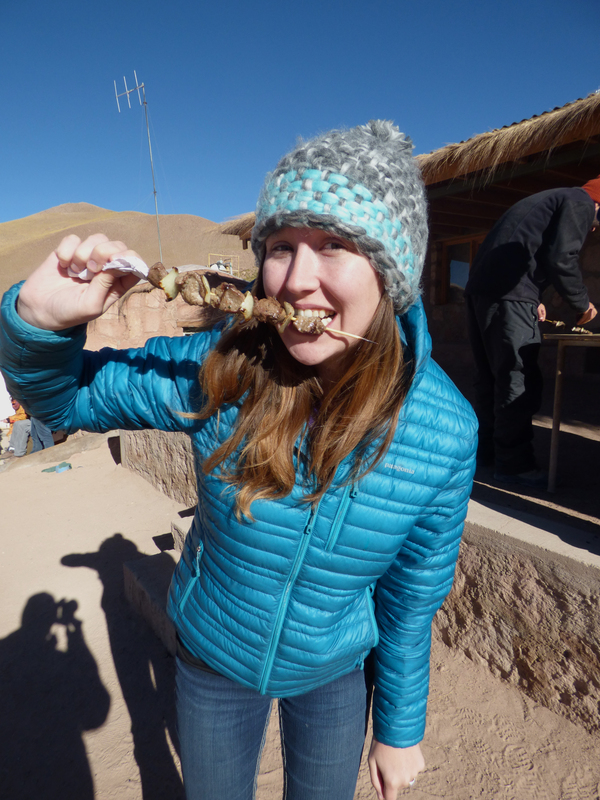 Llama kabobs in the middle of the desert. Our first adventure outside of the town was sandboarding! Since there’s no snow in the desert, we had to make do with the sand dunes. The company stopped renting out skis for sandboarding a few years back, so my dream of sand skiing died on the spot. 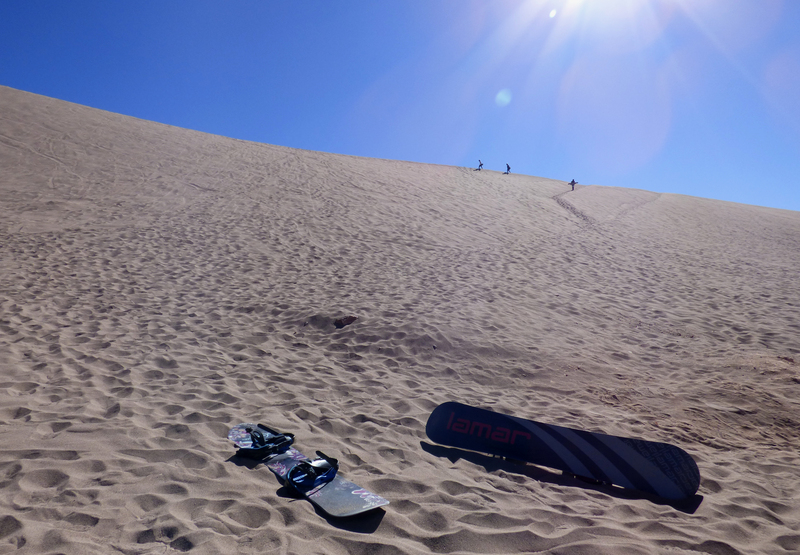 When we hopped in the van and headed out to the dunes, I reflected on my time learning to snowboard… My friends that so kindly taught me to snowboard will understand my slight trepidation going sandboarding. While I greatly enjoyed snowboarding, and even went a second day with my cousin, I was by no means talented at it. I am a skier, and having both of my feet attached to a single plank rather than two skis was my downfall. However, this small amount of snowboarding made sandboarding a piece of cake. 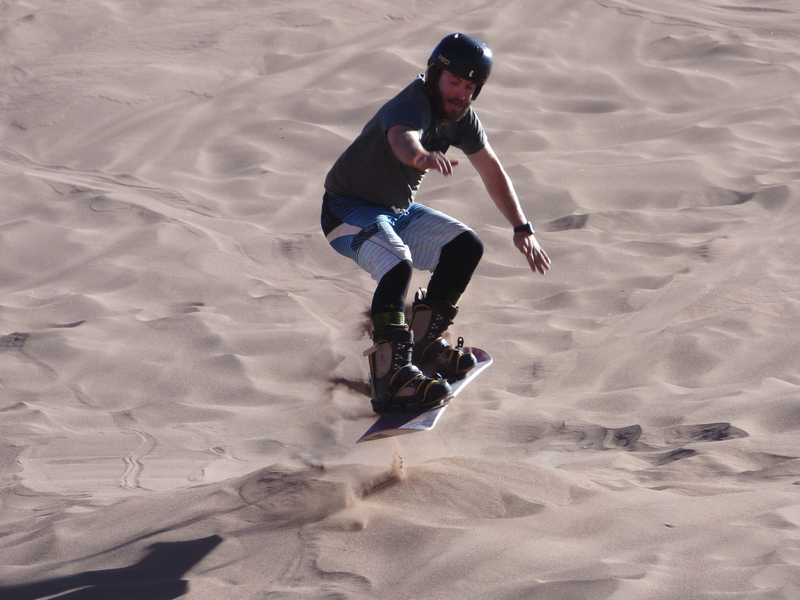 Sandboarding, in fact, is even easier than snowboarding!! I didn’t exactly master it, but I got 7 runs in with minimal falls and a smile on my face. It even made me want to go snowboarding again just for kicks and giggles. Chase took to sandboarding like a seasoned pro. Aside from flying down the mountain with beautiful turns and stops, he and our friend went as far as making jumps and flying through the air with the greatest of ease. He absolutely nailed it! The competitive side of me was pissed that I wasn’t that awesome on my first try, but the rest of me was so proud of him! That, my friends, is why he makes such a good freestyle coach with all of the kids. Combine natural talent and fearlessness, and you get Chase in any snow (and now sand) sport! Chase jumps over the man made sand jump we created. The next morning, we were up and waiting for the van pickup at 5 am to head out to the geysers for the sunrise. Our van was 40 minutes late, which sent me in to a panic. The company had no phone to call, so we had to just sit and wait and hope. At 5:40, the van rolled up and squealed to a halt. Crisis avoided. Apparently this is quite normal. After all, it is “Chilean time”. Even after almost 3 months away, I have yet to get used to this! 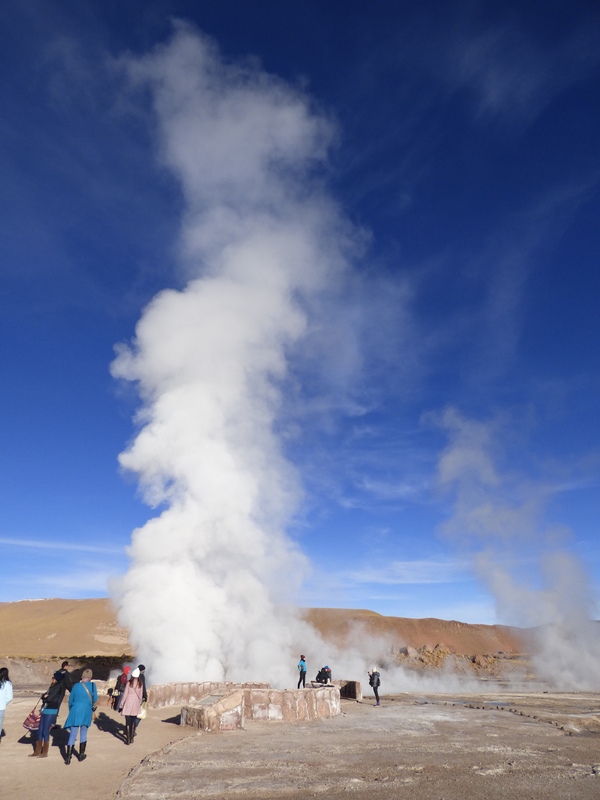 We drove through dirt roads and giant potholes for 2.5 hours before we arrived at Tatio Geysers while it was still dark. we could see outlines of the steam rising in to the sky. The company we were with made everybody hot coffee, egg and cheese sandwiches, and an array of muffins to get our day started. This was the best breakfast we have had in Chile so far! Holy tasty! As the sun began to rise, we got to walk around through all of the geysers and capture some beautiful photos! Unfortunately, we didn’t get one of the colorful sunrises we had hoped for, but it was beautiful nonetheless. After breakfast and walking amongst the geysers, we went to the hot springs right next to them. It was -12 degrees Celcius outside (10 degrees Fahrenheit), and I wasn’t thrilled to hop in the steaming hot springs. 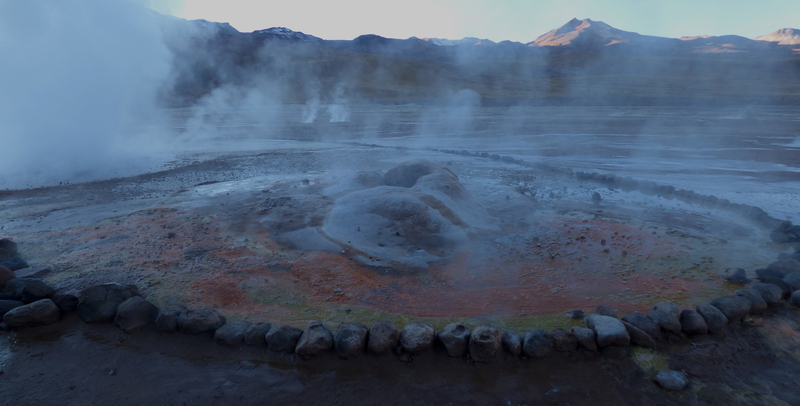 However, when would I ever get the chance to strip down to a swimsuit, jump in a desert hot springs next to geysers in the middle of Chile?! That’s right, never. So, I grew my balls of steel and hopped in with Chase and the rest of our group! Let me tell you a little about these hot springs. They are the equivalent of a broken hot tub! The water was borderline cold, then whenever we reached a point where the heat came bubbling through, we got what felt like third degree burns! Hot, cold, hot, cold, etc…. I only spent a few minutes before braving the even colder temperature outside to change, but Chase managed and entire 15 minutes! I don’t know whether that was brave or stupid… Nonetheless, we finished that part of the adventure shivering our way home in the van and taking photos of the local plants and wildlife. Totally worth it! 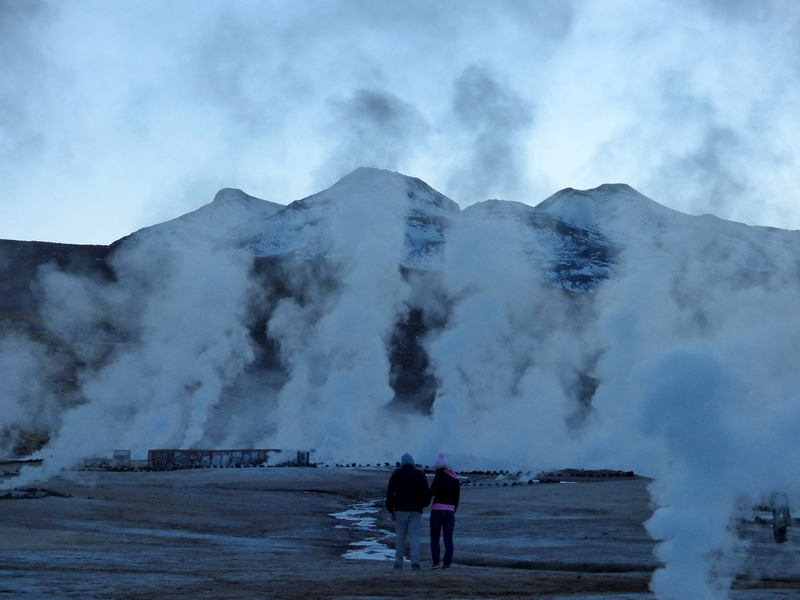 Tatio Geysers is the third largest geyser field in the world. This geyser would explode up to 4 meters in the air, with the steam rising far above the others. At the bottom of this photo, you can see a woman standing, giving a bit of perspective to the size. After the geysers, we had a small break in town before heading out to Valle De La Luna and Valle De La Muerte. We had a honey beer (I’m serious, I love this beer. It’s like beer nectar!) and lunch while we waited. But, we also had a little time to explore the outskirts of town, where we discovered a woman with her own little handmade ice cream hut. We tried many flavors, including some that we had never tasted before! Chase absolutely loved his quinoa ice cream, and I went so far as to try some Pisco ice cream! They were smooth, sweet, and very interesting. I will admit, however, there’s no way I will eat them again. 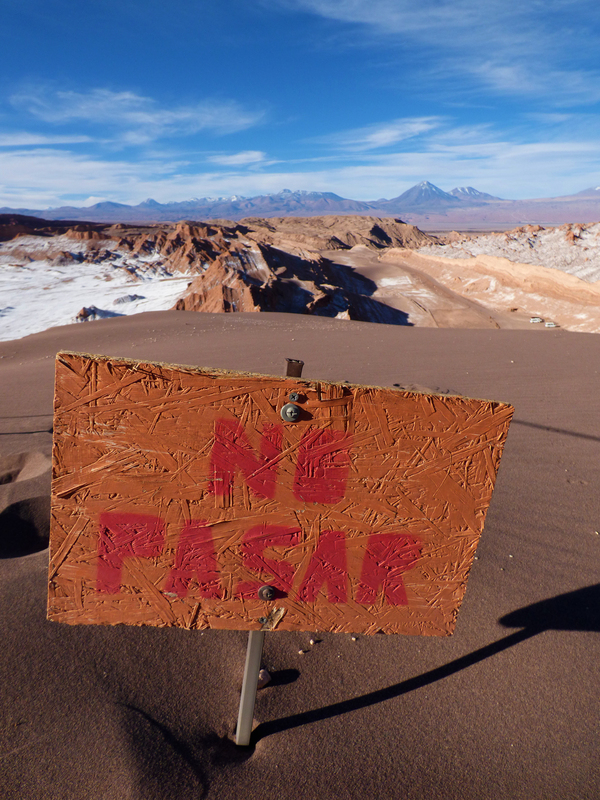 Later in the afternoon, we caught our van to head out to Valle De La Luna and Valle De La Muerte. 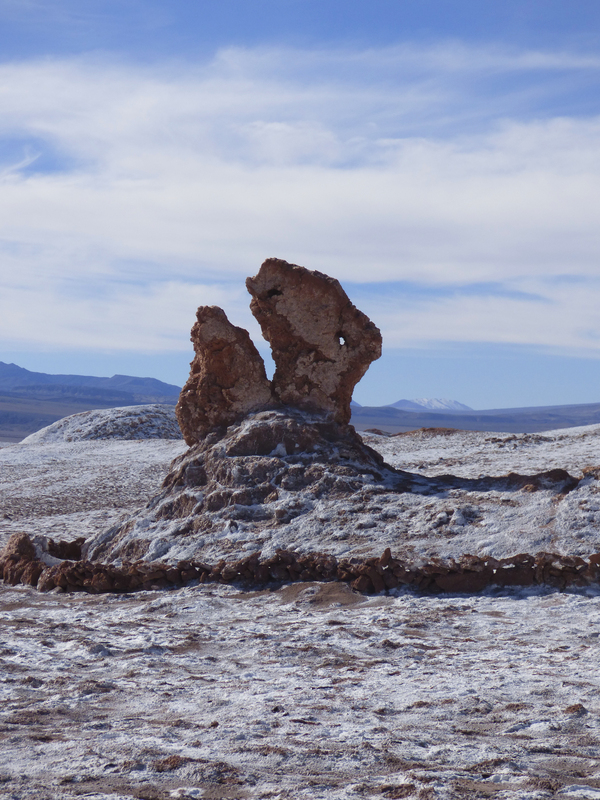 Our first stop was the very end of the Valle De La Luna, the Tres Marias. These are three rock formations that are thousands of years old, appearing to be three women in three different positions. One is in prayer, one raising her hands to the sky, and the third kneeling and watching the other two. Nearby, a rock formation also stood (Chase’s favourite), that was the head of a T-Rex. We then drove through the rest of the valley, which was filled with salt mountains, giant sand dunes, and huge rock formations. We hiked to the top of the Great Dune, the largest sand dune in the valley, to look over the valley in it’s entirety. The entire valley is a circle shaped like the moon. It is made up of the Salt Mountain Range, Giant dunes, and a rock formation known as the Amphitheatre. It was breath-taking! 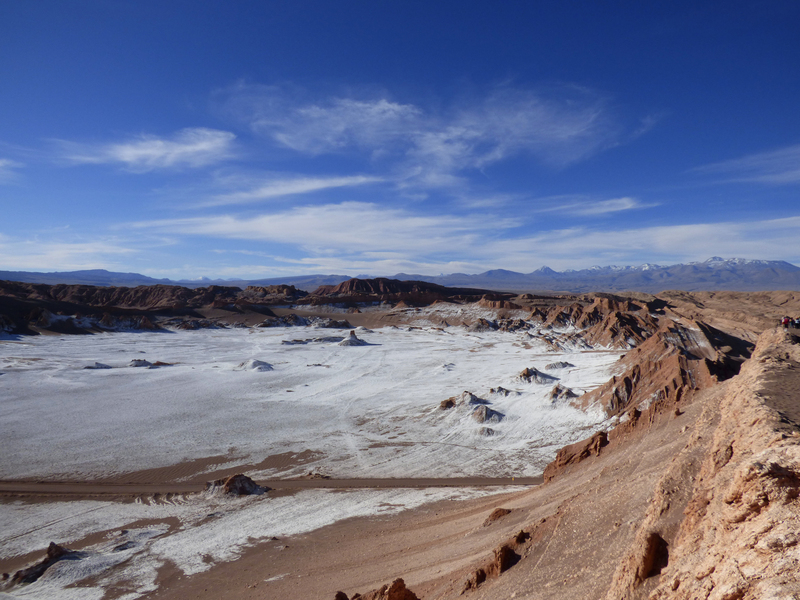 After the Valle De La Luna, we headed over to the Valle De La Muerte, also known as the Valley of the Dead. This valley is uninhabitable. It is filled with spiked rock formations, dirt, and more steep cliffs. As we looked out over it, the drop off in front of us was sheer rocks that end in sharp, jagged rocks at the bottom. It was surreal, standing at the top to see just how large the valley was. 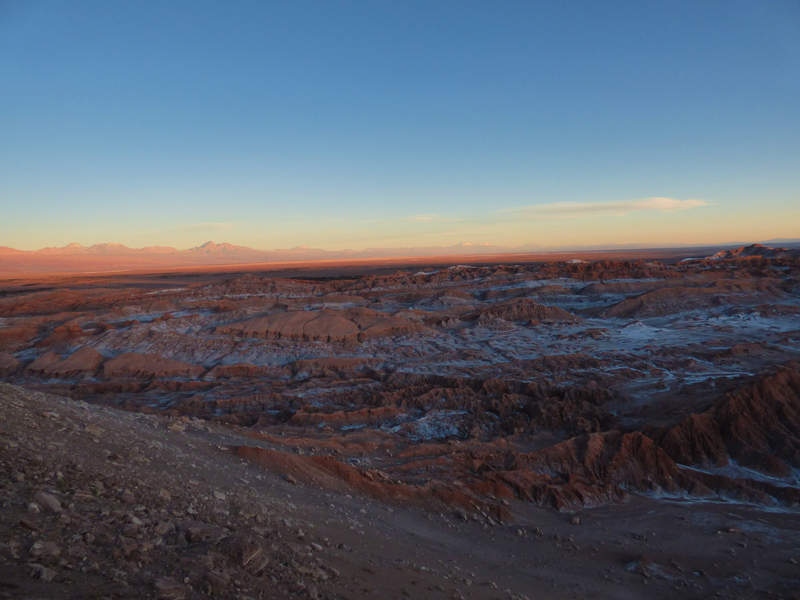 Right before sunset, we arrived at the lookout over Valle De La Luna for the sunset. All of the books and reviews say that this lookout is where a person can sit and watch the valley turn 7 different colors before sunset. Those reviews are true, but their photos don’t come close to doing it justice. What may appear to be an amazing photo to you, is just a reminder to me at how impossible it is to capture the beauty of the 30 minutes we sat and watched. It is an experience I hope that all of the people that see it every evening appreciate to it’s fullest. It is truly incredible. Every single moment was so beautiful, yet so different. It is the first sunset that I can say rivals a Nevada sunset. Except in this case, we were looking at the land in the opposite direction. AMAZING! 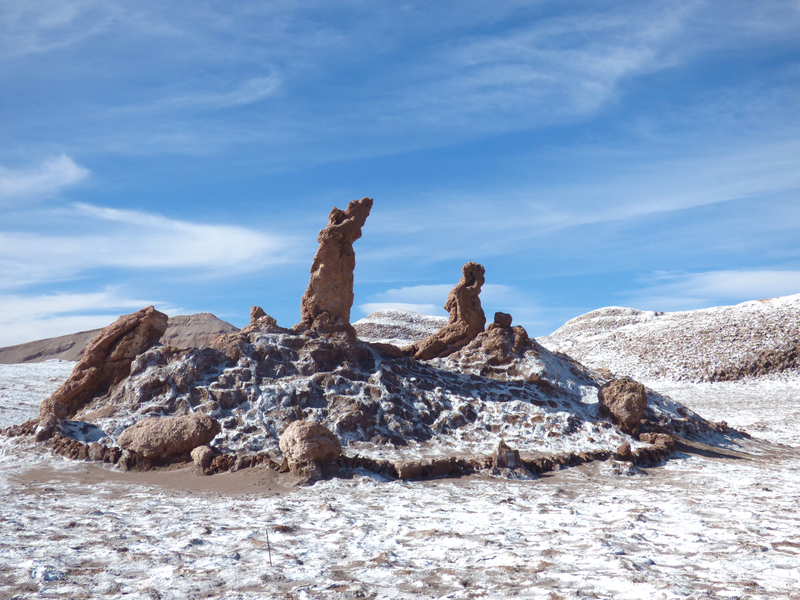 The Tres Marias in the Valle De La Luna. One prays, one lifts her hands to the sky, and the third watches the other two. The T-Rex shaped rock, and also Chase’s favourite! Three vastly different layers to one valley. 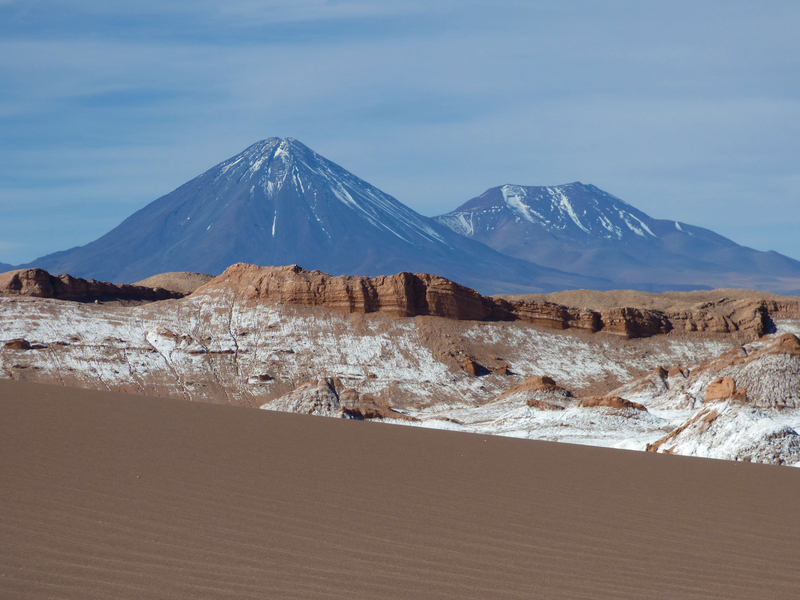 The Great Dune, the Salt Mountains, and volcanoes as the backdrop. Shots like these are a favorite of mine, as they depict the different sections of a single area. Valle De La Luna from the top of the Great Dune. There are many more excursions and sights to see in San Pedro, and I wish we had time for them all. The culture, the people, and the surrounding lands are a special place. This was our last stop in Chile, and certainly a memorable one at that.